We have a wonderfully atmospheric opening as a man tries to enact a spell in his excellent study/laboratory – but it doesn’t work. And seems to be just one of many many failed attempts. He leaves his house and hurries to an inn with many obviously wealthy gentleman while the voice over tells us about this society of English magicians that meets in York. And that, as gentleman, they’d never harmed anyone by magic nor done anyone the slightest good. Nor, for that matter, had any of them actually managed any real magic. Of course, that doesn’t stop them having a reputation of being the wisest and most magical men in Yorkshire. And eating big, expensive meals it seems. The first speech comes from a Mr. Segundus, our failed magician who asks the salient question – why isn’t magic still around? This is, apparently, a terrible question to ask – they study magic. That doesn’t mean actually DOING any, oh indeed, no. It’s definitely not a thing gentlemen should ever do – and they mock him fiercely for doing so. The next day though a Mr. Honeyfoot catches up with him to agree with his point as Segundus frustrated, goes from book shop to book shop looking for books of magic, not just about magic (which is why he came to the Society at all, for the few pages it possesses). Even more frustrated because every time he reserves a book someone manages to get to the shop and buy it anyway – a man by the name of Norrell. The call on Mr. Norrell in his awesomely “convoluted” home with an incredible library and brilliant atmosphere who greets them by critiquing some of Segundus’s academic work while Segundus is awed by all the books. 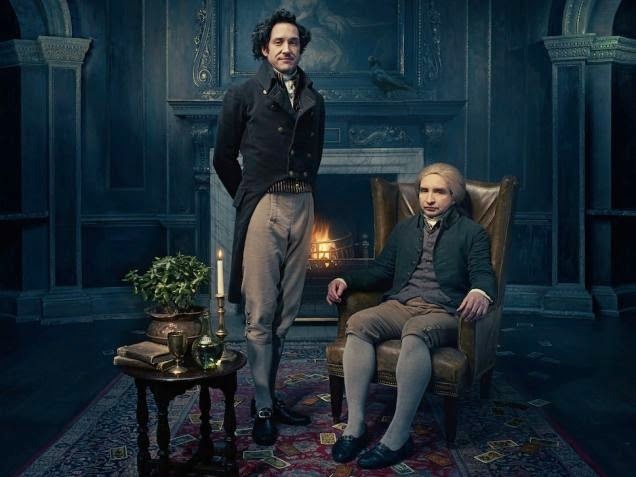 Mr Norrell is happy to let them browse (after consulting with a man I took to be his butler) like giddy schoolboys among all the books they’d only ever heard of with Norrell scathingly criticising each one. Segundus and Honeyfoot are unwise enough to bring this up at the next society meeting – only to be mocked and ridiculed. They insist that Norrell must prove himself. Challenge issued! To the Minster in the dead of night. Norrell’s servant presents Norrell’s written word that if he fails to demonstrate his power he will retract his claim and never make a similar claim again. He would be publicly shaming himself and admitting to be a liar – aie the horror! Even the head of the society thinks it’s going a bit far – especially when he also demands the same promise from them. Despite his initial reluctance, the prideful head of the society is happy to sign to show he doesn’t believe him – while Honeycut agrees to sign because he wants Norrell to succeed and use his power to help England win the Napoleonic wars. Segundus is the only one who will not sign because any chance of him not being involved in magic in the future is just too much. To London, with Norrill’s disapproval and his servant stoic disapproval of the same (I do wonder who is the Master at times) where he has caused a stir in the press, but scepticism is still high. Norrill is also pretty pissy about conjurers who give them all a bad name but his servant (or boss) pushes him to get his act together to impress the Secretary of State for War. At least parliament is entertainingly witty. Norrill gets his invite back to Sir Walter (the secretary of war’s) home and his very doubting mother/sister/random woman and very sick but encouraging fiancée. Again Norrill faces a level of respect for theoretical magicians and a whole lot of doubt over his claim of being a practical one. Ultimately, magic is not respectable enough for Sir Walter be involved in. The servant confronts the street magician, Vinculus, and in a game of duelling tarot it seems the Street Magician is not powerless – changing all his cards to the Raven King which is creepy and impressive. Meanwhile the socialites come to Norril to try and convince him to perform and gain influence but he’s too proud. Until he hears that Sir George’s fiancée is dead from her ailment – and with her a copious income that Sir George was relying on for his political campaigns (no-one even pretends this is about love). Norrill is now intrigued by a necromantic solution. Despite his misgivings, he is easily talked into it. Alone (much to his fanclub’s annoyance) he summons… someone. Death? A fae? Someone very creepy at least. After much creepiness, Norrill refuses to spread the creature’s name or use his services (more talking of the second wizard) – the deal is struck: half of the lady’s life in exchange for resurrection (which they settle on 35 years). The creature leaves, taking “something of hers” to mark his claim. She is resurrected, much to everyone’s shock. Emma lives again, missing only one finger which she doesn’t find very disturbing. That proves his power, certainly. So it’s not particularly sad when said father drops dead, seemingly freezing himself half to death in an attempt to torment a sick servant. Nice man. Jonathan is rather unseemingly gleeful about having a job now (an estate to run) and wastes no time brainstorming how to propose to Arabella with his sick servant Jeremy. Now it’s Jonathan’s turn to have Vinculus appear and sells Jonathan Norrill’s spells. He shows these spells off to Henry and Arabella because, in his rather feckless and random way, he’s decided to become a magician. To everyone’s surprise, he makes a spell to see his enemy work. I actually thought this show would take place in York – it’s a shame it doesn’t, some settings in a British city beyond London would be interesting. Yes, there are urban settings in the UK that don’t include London, though I don’t think the south-east is convinced of the fact.